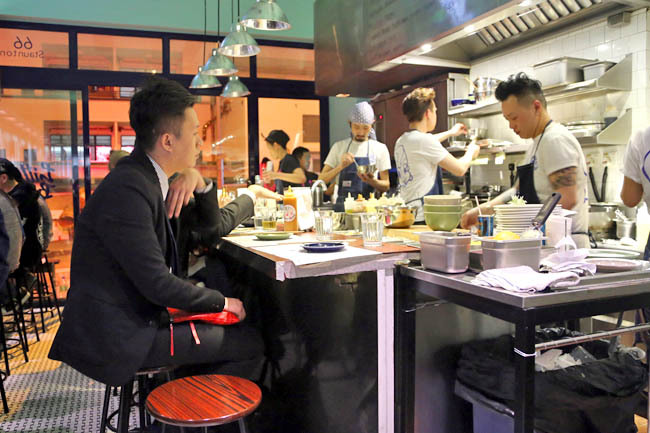 Hong Kong’s culinary scene is always evolving and enlivening, and new restaurants gain a footing by being edgy and unique. Little Bao was recommended by a PR friend who worked in Central, who mentioned it was still one of the hottest food places. 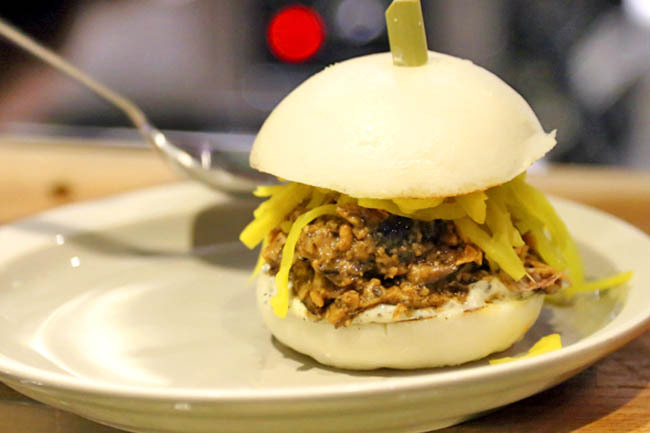 Well, if you look at it from one perspective, Little Bao is serving what many Chinese are already familiar with – bao or buns. The tiny shop somehow brought the hip level up many notches with an endearing yet weird looking mascot, an open concept kitchen reminding you of authentic tapas bars in Spain, and energy that was uplifting and inviting. 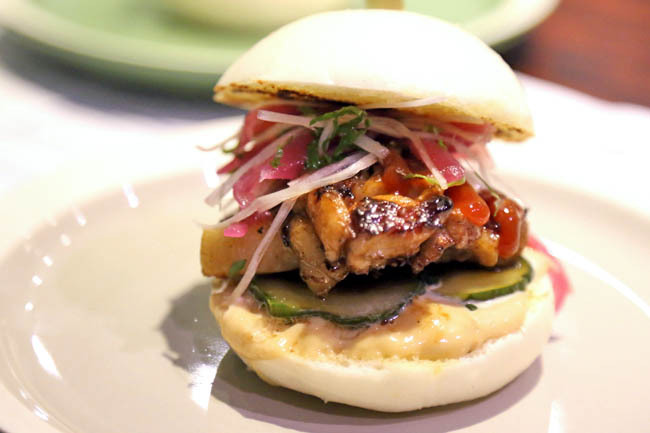 Eating Bao, or ‘Asian Burger’ has become cool again. As reservation was not allowed, I joined some others in the cold outside, for 30-40 minutes or so to get a seat. On a weekday. I only wanted the counter seats, and that took even longer. 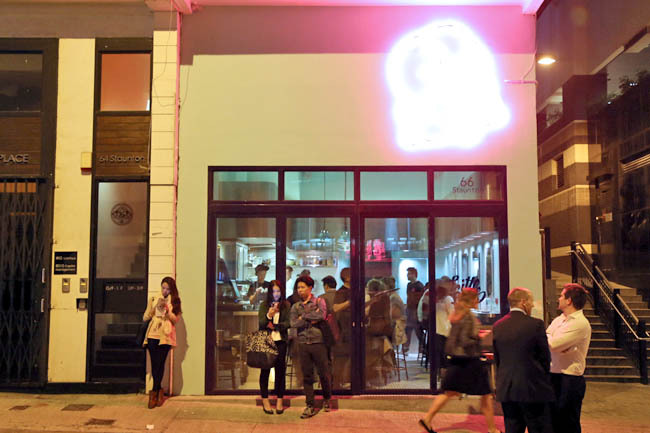 The vibes inside was never boring, the icon of ‘Little Bao’ looking like an Asian tweety bird with punk hair plastered almost everywhere, including one next to a half-naked Tony Leung. The crew moved in a systematic Hong Kong rhythm. Requiring this speed and organisation needed teamwork and un-spoken coordination. 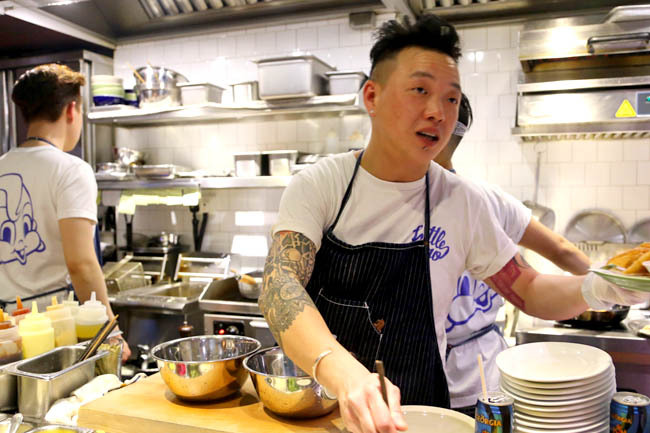 Look out for owner May Chow (with a resume from Yardbird, TBLS and Bo Innovation), spotting short-cropped hair in boyish fashion, the epitome of laidback cool. Ok, the food. The Original Bao (HK$78, SGD$12.90) came, looking smaller than I expected, though sandwiching tender juicy braised pork belly, shiso leek salad, sesame dressing and hoisin ketchup. Good things come in small packages I guess. The explosion of tastes… Take my money already! Expect some mess, and perhaps some sauce flowing down the corner of your lip. Remember to lick it back. They did not allow ‘bao-cutting’. Might as well, finish it your own. Their sides. 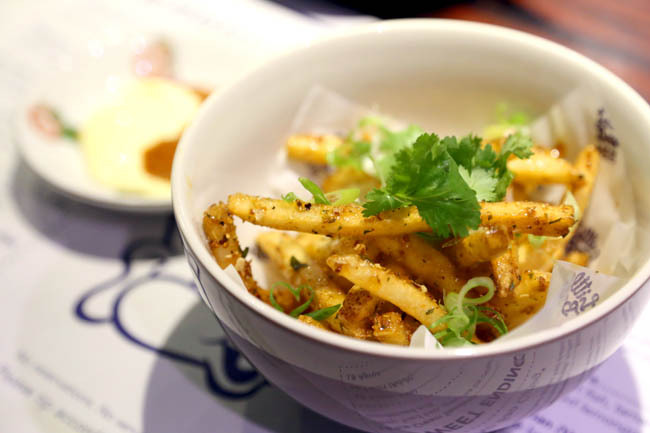 We had LB Fries (HK$68, SGD$11.25) tossed with roasted tomato sambal, kewpie mayo and cilantro was addictive; and Orange Chicken (HK$98, SGD$16.20) screamed for a second helping. 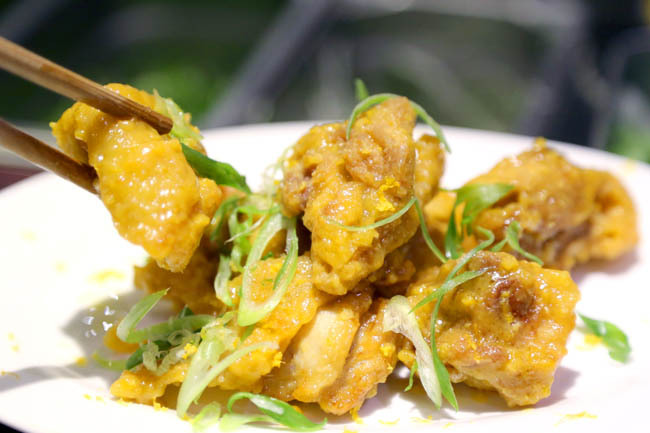 It was after all, deep fried chicken with salty egg yolk, honey glaze and orange zest – sweet, salty, citrusy in harmonious fashion. 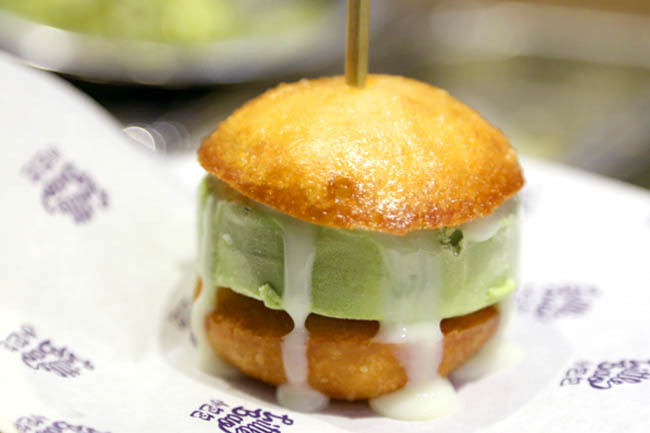 All that I mentioned could not win the satisfaction given by the Ice Cream Sandwich (HK$48, SGD$7.90) – green tea ice cream in deep fried bao, drizzled with condensed milk. Seemed simple to make, and that possibly any cha chaan teng could do it, but this LB version was just ‘wow’. A meal for two was about HK$400-500, which felt expensive considering we ate little things and had room for supper subsequently (Beef noodles Kau Kee is a walk away). 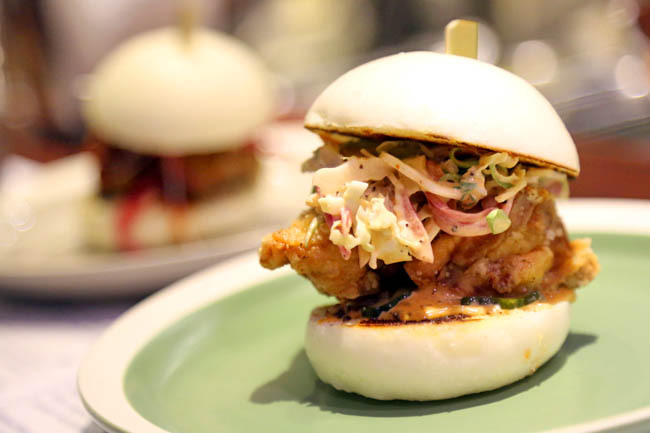 My person take: Little Bao is worth a try. You do not get anything like this around, yet. I must have missed this place. I do love a good old Bao, even if it is street food variety in London (a little pop up called Bao, or a small brand called Yum Bun! ), Is there anywhere in SG that sells Bao? I cannot think of anywhere myself, but I need the experts’ opinions. There are many stalls selling baos in Singapore, but good and handmade ones are few. I usually go to Katong or Toa Payoh to get my fix, though they are mini ones.